Hope you all had a wonderful weekend!! I had a very relaxed Mother's Day yesterday. Hubby and son made me breakfast in the morning and then I sat out on the deck enjoying the sunshine for a while. I made a card (which I'm posting today) and then headed to oldest son's for dinner. So great to spend time with the family! Today I'm heading out to the nursery to pick up some more annuals for my pots. But before going, I wanted to particpate in today's Clean & Simple challenge (CAS170 - three panel technique) at SCS. I have always loved triptych cards, so this was an easy challenge for me. 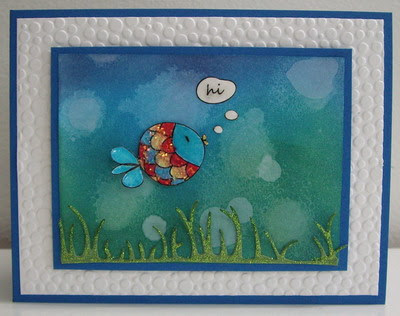 I'm also posting the card I made yesterday using my digital stamp from Clear Dollar Stamps - Splash! which was designed by the very talented Lisa Lara. Hope you like the cards for today! Oh, quick note ... you may have noticed that I've added a "Search" feature to the blog. I have removed the long and cumbersome list of labels and replaced it with the much "user-friendly" search engine. Oh, oh ... one other thing ... I LOVE this stamp set ... and I was looking at my pots of bulbs today and realized that I have one that must have been used as inspiration for one of the stamps below. 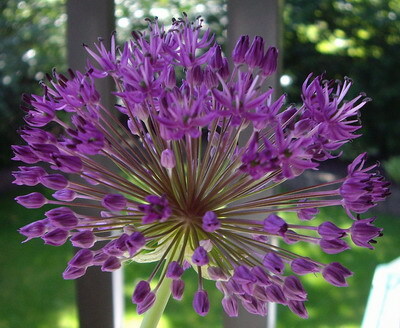 Here is a picture of one of my alliums. I stamped the images and then cut the panel to 4 1/2" x 2 1/2". I colored in the flowers using ink and blender pen (marker layering technique). I stamped the sentiment and mounted the panels onto the card base, popping them up with dimensionals. I wanted the images to stand on their own (they are so pretty), so I didn't add any frames or other color of cardstock. Here's another fun and easy card using an adorable stamp from Lisa Lara. I added stickles to the "scales" and the reeds, but it's hard to see in the photo. They add a lot of glittery bling! I sponged my main panel (garden green, tempting turquoise, pacific point) and then dropped water on top and absorbed the excess with a paper towel .... I love this effect and saw it done on a few cards by Karen Dunbrook. I die-cut the grass and added green stickles. I colored the fish and then coated his scales with clear stickles and his tail and head with Crystal effects and left it to dry for a few hours. Then I just mounted everything together as per the photo, popping up the fish with dimensionals to add depth. Labels: CAS, cheery lynn, digital stamps, dry embossing, friendship, marker layering, Stampin' Up! 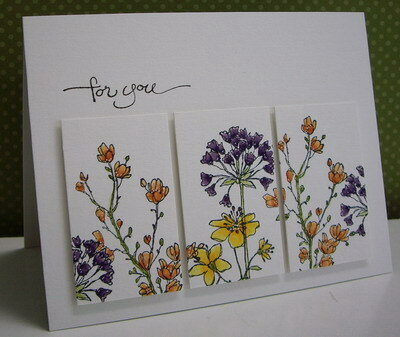 Your Simply Soft card is so lovely - makes me think of a perfect flower border in a garden. Also I love the technique you used to create the water in the second card - it turned out so well. Enjoy the gorgeous weather we're having here in the Vancouver area! I'm heading out to work in my garden for the afternoon. Two winners today! Both very cute. Love the flowers and the clean lines and that fish is adorable! Love them both Loll! Beautiful, wonderful creating!